Denver on a Spit: A Denver Food Blog: 11N at New Saigon: Will You Be My Valentine? 11N at New Saigon: Will You Be My Valentine? Not too long ago, while out to dinner with my family, I was about to dig into my plate when one of my 3-year old sons grabbed my chopstick-wielding hand and exclaimed: "Papa!" I stopped--we all did, so serious did he sound-- and asked what he wanted, not sure if we were about to make a fast break for the potty or if I was headed into another irrelevant toddler rant about how the sun is a big ball of fire. Neither it turned out; instead he asked, "Papa, you're not going to take a picture?" "God, what I have I done!" Was my first thought as I laughed (and got out my camera to take a picture of course). Instead of saying grace, or thanks, or folding a napkin across his lap my son thinks that one needs to take a picture of food before it is eaten. 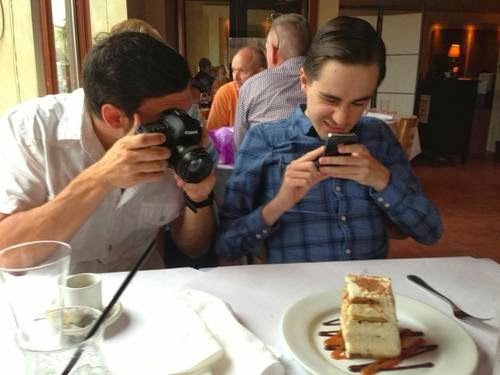 At first it made me think of how silly and obnoxious it is for a diner to be constantly snapping photos (though I never use a flash) of every plate that is put before him. On the other side, food can be great and memorable, and we take pictures of monuments, churches, sunsets, and our kids, so why shouldn't we do the same with our food? 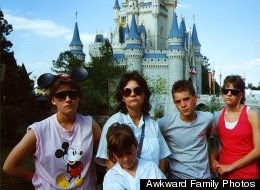 The fact that there are whole websites dedicated to awkward family photos is proof enough that taking pictures of food is not the worst use for your camera. Besides, what my son was really doing was pointing out to me was that in front of me was one photo-worthy bowl of food, that for so many years I have been eating-- and as if taking it for granted-- I have never once taken its picture. I am talking about the Bún Hanoi at New Saigon. Bún Hanoi, also known as 11N, and I have a long history. It used to be hidden on one of the all Vietnamese pages of the New Saigon menu and it was through some Vietnamese-American friends that I was introduced to it. One used to get funny looks and even groans of disapproval when ordering from the Vietnamese section of the New Saigon menu, and I'm not sure why 11N was ever on what we came to call the "secret menu page". It's not like it was a fetal duck egg or other delicacy that would turn the stomachs of most American diners just to read. No, it is quite the opposite. It is a noodle bowl full of mundane assorted pork parts, some grilled shrimp and a handful crispy egg rolls along with fresh veggies and herbs. It's like the Vietnamese noodle bowl combo platter. What meat-eating human being couldn't love a dish like 11N? The answer, to be clear, is none. None could not love 11N. 11N is a perfect meal of slither, crunch, chew, and spice. It is hearty but not heavy or overly filling. I don't remember exactly when 11N made it on to the English menu, although as New Saigon grew in popularity to its current status where its still-packed dining room hosts far more non-Vietnamese diners than Vietnamese diners on any given night, most of the menu got translated and shared with the masses. But for a long time now, even though everything else I have ever tried at New Saigon I have loved-- from the whole fried fish to the interesting curries and seafood platters-- I am almost always end up ordering my beloved 11N. For someone who eats at different restaurants every week, New Saigon and its 11N has become an unusual routine in my life over the years. 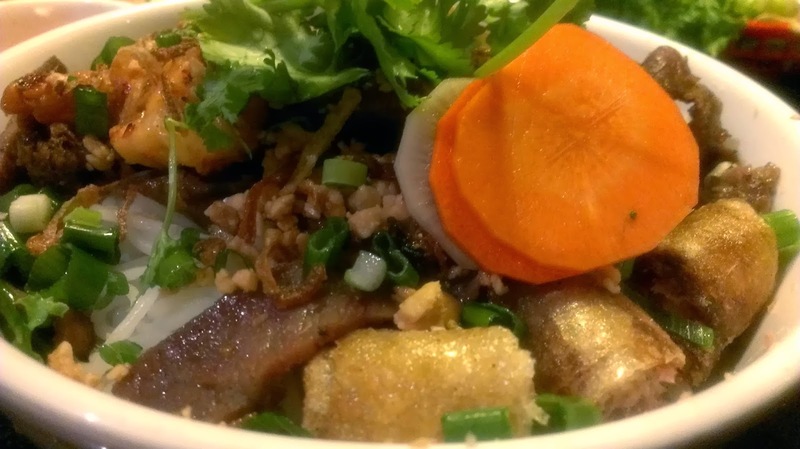 I don't write about every restaurant I eat at, and maybe I haven't written about New Saigon yet because I just feel so at home there-- such a personal connection that I either forget that I am even out to eat-- or on some level I just don't want to share. But it's not like New Saigon is a secret to anyone these days, and while the city is full of good Bún bowls, I ask you to try 11N at New Saigon and see if you don't fall in love as well.